A blast that punched a large hole in the fuselage of a passenger plane at Somalia's Mogadishu airport on Tuesday was caused by a bomb, officials say. "It was a bomb that exploded in the Daallo Airlines flight. It was meant to kill all aboard," Transport Minister Ali Ahmed Jamac said. One passenger was sucked out of the plane and died, and two other passengers were injured. The Djibouti-bound Airbus 321 was forced to make an emergency landing. Some reports suggest that an explosive device may have been hidden inside a laptop of one of the passengers. The blast happened shortly after take-off from the Somali capital. No militant group has so far said it was behind the explosion. 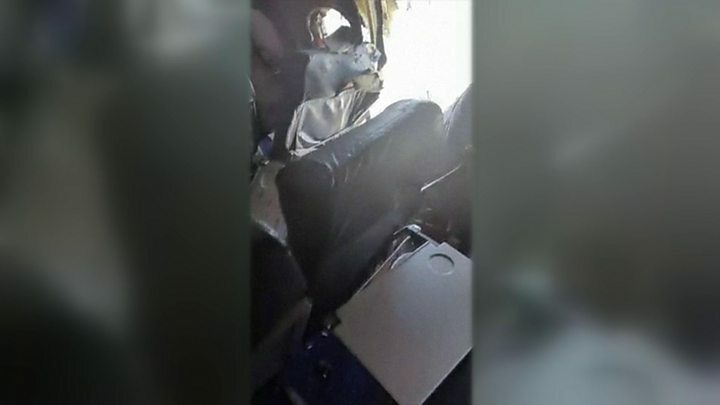 In a statement shortly after the incident, Daallo Airlines said an investigation was launched by Somalia's Civil Aviation Authority, as well as a technical team from the aircraft's owners and its manufacturers, Airbus. Mohamed Hassan, a police officer in Balad, an agricultural town 30km (18 miles) north of Mogadishu, said residents had found the body of a man who might have fallen from the plane. Serbian captain Vlatko Vodopivec said at the time he and others were told the explosion was caused by a bomb. "It was my first bomb; I hope it will be the last,'' Mr Vodopivec said. He said the blast happened when the plane was at around 11,000ft (3,350m). Daallo Airlines flies regularly from its base in Dubai to Somalia and Djibouti. Somalia is battling militant Islamist group al-Shabab that has been carrying out deadly attacks in its quest to establish an Islamic state.